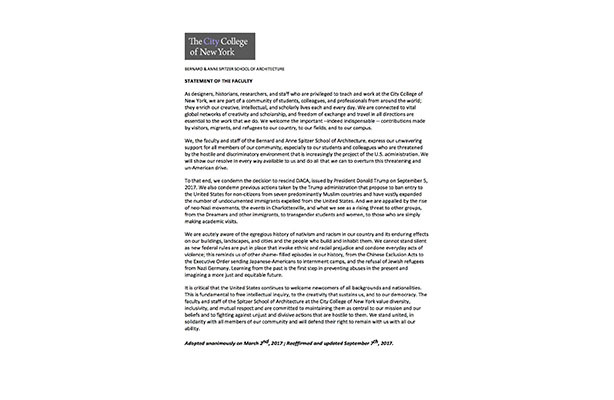 As designers, historians, researchers, and staff who are privileged to teach and work at the City College of New York, we are part of a community of students, colleagues, and professionals from around the world; they enrich our creative, intellectual, and scholarly lives each and every day. We are connected to vital global networks of creativity and scholarship, and freedom of exchange and travel in all directions are essential to the work that we do. We welcome the important ‐‐indeed indispensable ‐‐ contributions made by visitors, migrants, and refugees to our country, to our fields, and to our campus. 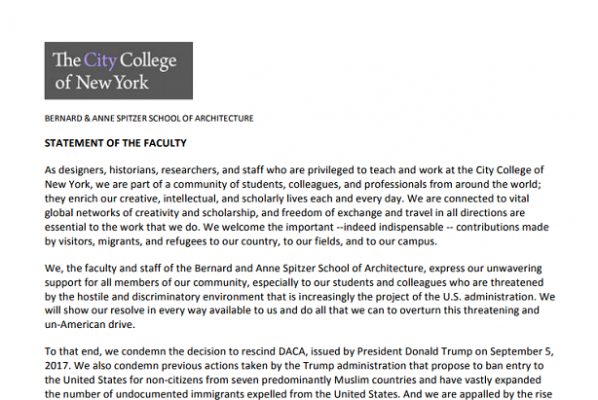 We, the faculty and staff of the Bernard and Anne Spitzer School of Architecture, express our unwavering support for all members of our community, especially to our students and colleagues who are threatened by the hostile and discriminatory environment that is increasingly the project of the U.S. administration. We will show our resolve in every way available to us and do all that we can to overturn this threatening and un‐American drive. To that end, we condemn the decision to rescind DACA, issued by President Donald Trump on September 5, 2017. We also condemn previous actions taken by the Trump administration that propose to ban entry to the United States for non‐citizens from seven predominantly Muslim countries and have vastly expanded the number of undocumented immigrants expelled from the United States. And we are appalled by the rise of neo‐Nazi movements, the events in Charlottesville, and what we see as a rising threat to other groups, from the Dreamers and other immigrants, to transgender students and women, to those who are simply making academic visits. We are acutely aware of the egregious history of nativism and racism in our country and its enduring effects on our buildings, landscapes, and cities and the people who build and inhabit them. We cannot stand silent as new federal rules are put in place that invoke ethnic and racial prejudice and condone everyday acts of violence; this reminds us of other shame‐ filled episodes in our history, from the Chinese Exclusion Acts to the Executive Order sending Japanese‐Americans to internment camps, and the refusal of Jewish refugees from Nazi Germany. Learning from the past is the first step in preventing abuses in the present and imagining a more just and equitable future. It is critical that the United States continues to welcome newcomers of all backgrounds and nationalities. This is fundamental to free intellectual inquiry, to the creativity that sustains us, and to our democracy. The faculty and staff of the Spitzer School of Architecture at the City College of New York value diversity, inclusivity, and mutual respect and are committed to maintaining them as central to our mission and our beliefs and to fighting against unjust and divisive actions that are hostile to them. We stand united, in solidarity with all members of our community and will defend their right to remain with us with all our ability. Adopted unanimously on March 2nd, 2017 ; Reaffirmed and updated September 7th, 2017.